Jjukumi or octopus are my hubby's favorite. He enjoys them even if they are fresh or boiled. They are too expensive but it worths it because seeing my hubby eating makes me feel so happy. You have no idea how he likes them. I sometimes buy them at the supermarket but usually my mother in law buys for us. She knows how my hubby loves them. Everytime we visit her specially when we go there to have meal with her, she usually prepares jjukumi. Here are some jjukumi that my mother in law gave us. I washed them well and boiled some water. When the water was boiling, I put the octopus and removed from the boiling water after a few minutes then drained. Just as easy as that! 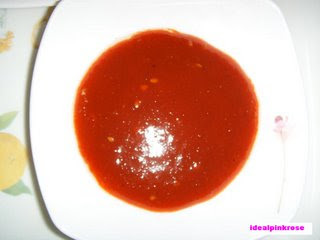 Then prepared my hubby's favorite sauce, the chokochujang or vinegared red paper paste.